Time still seems to be flying by for me lately, and somehow Canadian Thanksgiving has crept up so fast that it's only a few days away! I haven't even thought of any recipes or dishes that I could contribute to our family's meal this weekend, but I'm sure that it will be delicious no matter what! I don't usually post side dish recipes on my blog because I tend to make one-dish meals for myself, but Thanksgiving for a vegetarian is the perfect opportunity to make a meal out of a bunch of side dishes, so I thought today's recipe would fit in perfectly with the upcoming holiday! While I love regular mashed potatoes, I also like trying different versions of mashed vegetables, like this mashed rutabaga and this beet-parsnip mash I've made in the past. This variation uses a mix of cauliflower and pureed pumpkin as the base of the mash, and since neither of those ingredients are particularly flavourful on their own, I added lots of extra herbs and spices like garlic, thyme, nutmeg, some cayenne for a bit of spice, and nutritional yeast to add a cheesy dimension. 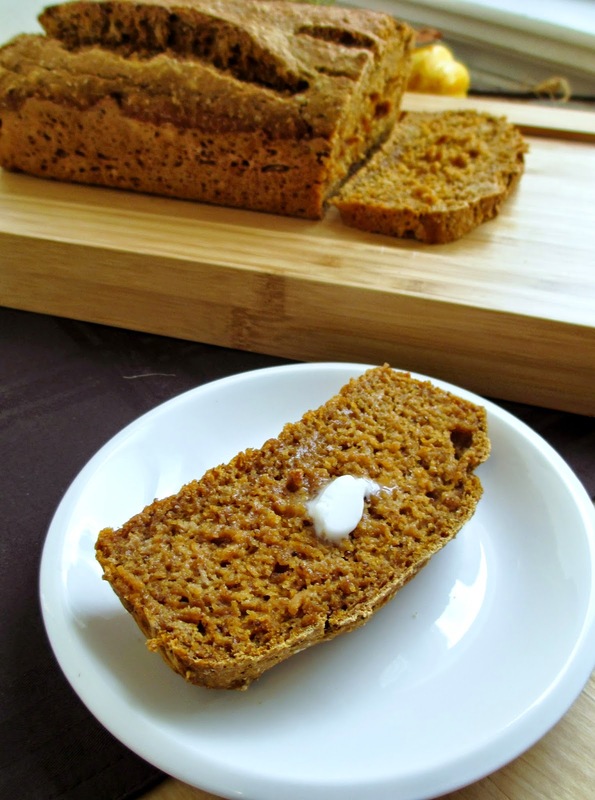 I loved how fluffy and creamy this was, and while I was perfectly happy eating it on it's own, it also worked really well as a topping for thick and hearty slices of bread - I ate mine with my leftover pumpkin beer bread, which paired together nicely! Bring a medium pot of water (filled a couple of inches high) to a boil over medium-high heat. Place cauliflower pieces in a steamer basket and place the steamer in the pot. Steam, covered, for about 10 minutes, until cauliflower is tender. Remove from heat and let cool until safe to handle. Place cauliflower and all remaining ingredients in a food processor and process until everything is pureed (you can leave it a bit chunky if you like). Taste and adjust seasoning if desired. 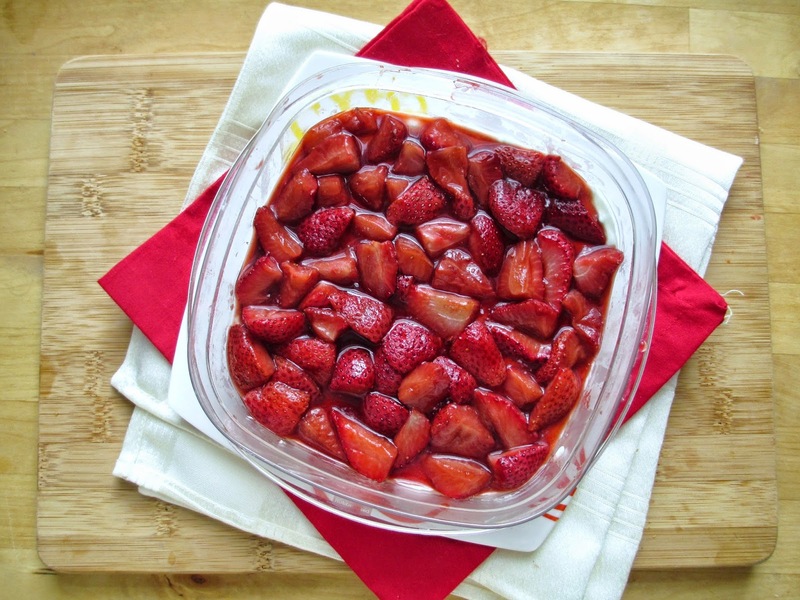 Serve as a side dish or on top of toast. Now that we're into October, I'm excited to share my first pumpkin recipe of the year with you! I'm not ashamed to admit that I'm one of those people who gets a bit obsessed with everything pumpkin related as soon as the weather starts getting cooler every year - I always look forward to pumpkin spice lattes, pumpkin pie, pumpkin scones and muffins, and pumpkin beer! Last year, I made a variety of pumpkin based treats, but the one that didn't quite turn out was a pumpkin beer bread. I realized what my mistake was though (using a beer that was too strong and dark), so this year I was determined to try another beer bread. 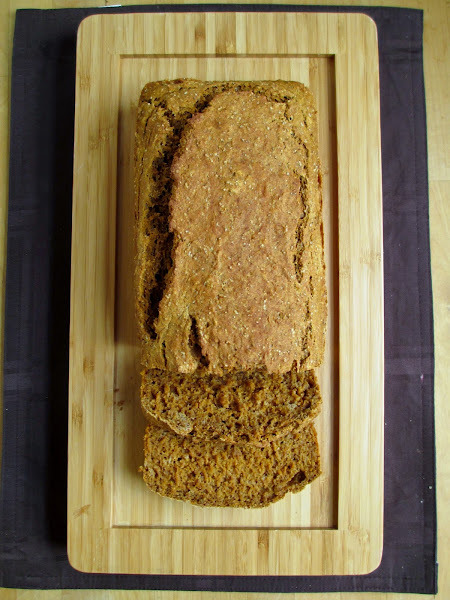 I love beer bread because it's so simple to make, not to mention super fun watching the mixture bubble and fizz when you add the beer! I also like how versatile it is since it's like a cross between bread and a loaf cake - you can eat it plain or buttered, toasted or fresh, with savory or sweet toppings, as a side to soup or on its own for breakfast. This particular recipe has lots of spices in it, a generous portion of pumpkin puree, and some maple syrup for a bit of sweetness to balance the bitterness of the beer. This time, I used a lighter blonde ale for the beer, but a light pumpkin beer would work really well too! I also wanted to add a bit of texture to my loaf by mixing in a grain like quinoa or millet. Unfortunately, I didn't have either of those in my pantry, but I did have some amaranth so I decided to incorporate it instead. Rather than using it dry though, I popped the seeds first so that it puffed up like popcorn. If you've never tried popped amaranth before, there are some helpful tutorials on other blogs such as Edible Perspective. 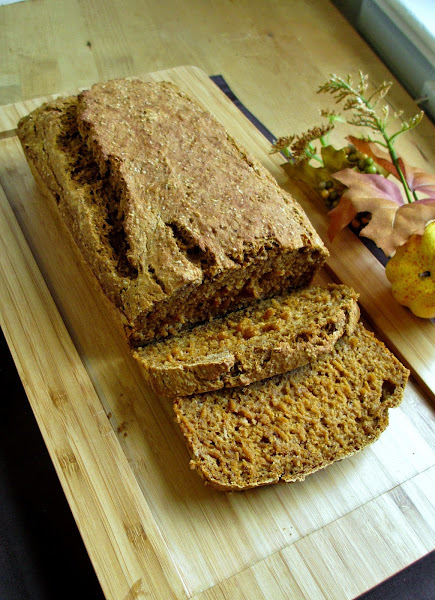 The amaranth wasn't very noticeable in the baked loaf, but you could see some light speckles throughout and it added a hint of nutty flavour, not to mention a boost of nutrition since amaranth is high in protein, fiber, and vitamins. 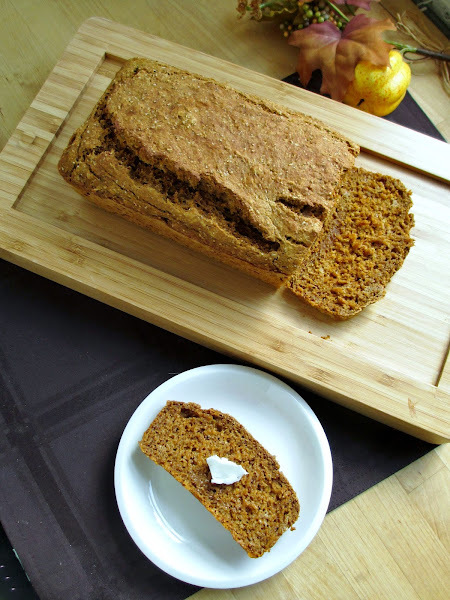 I enjoyed most of this bread with Earth Balance coconut spread, but I also ate some with a delicious pumpkin mash which I'll be sharing on the blog next week! Preheat oven to 375⁰F. Prepare a loaf pan by lining the bottom with parchment paper (optional) and spraying with cooking spray. First, to pop the amaranth, place a medium sized pot on the stovetop over medium heat. Add a small amount of amaranth (about 1 tbsp) to the pot and heat until it starts to pop. Once it starts popping, cover pot with a lid and shake frequently until it stops popping. Immediately transfer popped amaranth to a bowl. Continue in small batches until all the amaranth has been popped. Note: You will likely need to throw out your first batch or two, as it won’t pop properly. Mine didn’t start going until the third attempt! In a large bowl, add the flours, baking powder, spices, and salt. Whisk to mix thoroughly. Whisk in the popped amaranth. In a separate bowl, stir together the pumpkin, maple syrup, oil, molasses, and maple extract. Pour wet ingredients into the dry ingredients and stir a few times. Pour in the beer and stir gently just until all the dry ingredients are incorporated. Transfer mixture to the prepared loaf pan and smooth out the top. Place in the preheated oven and bake for about 50-60 minutes (I baked mine for 60 minutes just to be sure it was cooked all the way through – this could depend on your oven and the size of your loaf pan). Remove and let cool in pan for about 10 minutes, then remove loaf from the pan and cool completely on a wire rack. Makes 1 loaf. *Note: After a couple of days, I stored my leftovers, pre-sliced and wrapped well, in the freezer and defrosted slices when I wanted a piece. When the colder temperatures hit this month, all I wanted to eat for dinner was a big bowl of comforting soup with fresh bread. Since I had a huge head of green cabbage sitting in my fridge and local beets are in season, I figured this was the perfect opportunity to try my hand at a soup I've always wanted to make - borscht! Rather than sticking with a traditional borscht, I made more of a vegetable stew with beets, potatoes, carrot, cabbage, and cauliflower. And since I was using a vegetable broth instead of beef broth, I tried to make it extra flavourful by cooking some onion, garlic and ginger first, and adding lots of spices and herbs like caraway, cumin, coriander, thyme, and bay leaves. A bit of plain yogurt or sour cream works perfectly as a topping for this soup, and if I had some fresh dill, I would have added that as a garnish as well. For a healthy broth-based vegetable soup, I thought this was actually really tasty and I didn't mind eating it for both lunch and dinner several days in a row, since it made such a big batch! Plus, how can you not enjoy eating something with such a pretty colour! Heat a large pot over medium heat and add the oil or butter. Add the onion, garlic, ginger, caraway, cumin, coriander, and thyme. Cook, stirring frequently, for about 4 minutes (until the onion begins to soften). Add the potatoes, carrot, beets, cauliflower, cabbage, salt, and some freshly ground pepper to the pot. Cook, stirring occasionally, for about 10 minutes. Then add the vegetable stock, water, and bay leaves and bring to a boil over medium-high heat. Once boiling, reduce heat to medium low, partially cover with a lid, and simmer for 30-40 minutes, until all the vegetables are tender. Remove pot from heat. Discard the bay leaves and stir in the agave and vinegar. Serve hot, topped with plain yogurt and a handful of chopped fresh dill if desired. Season with additional salt and pepper if desired. 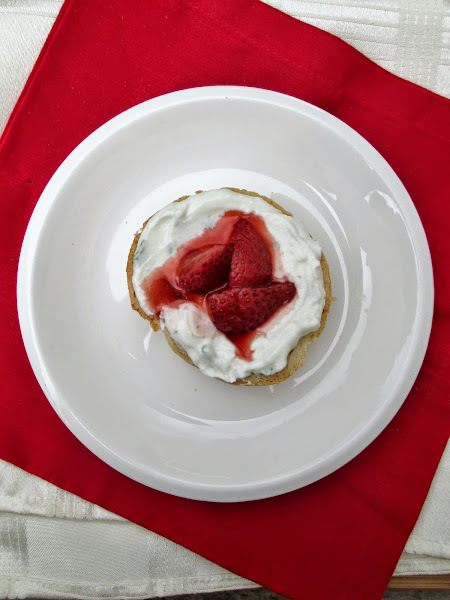 Somehow another month has passed without a blog post or recipe to share with you, but I'm going to try to make it up with some new recipes starting next week! I made a big batch of soup this week that I'll be sharing here soon, and I hope to start making some pumpkin treats this weekend too! 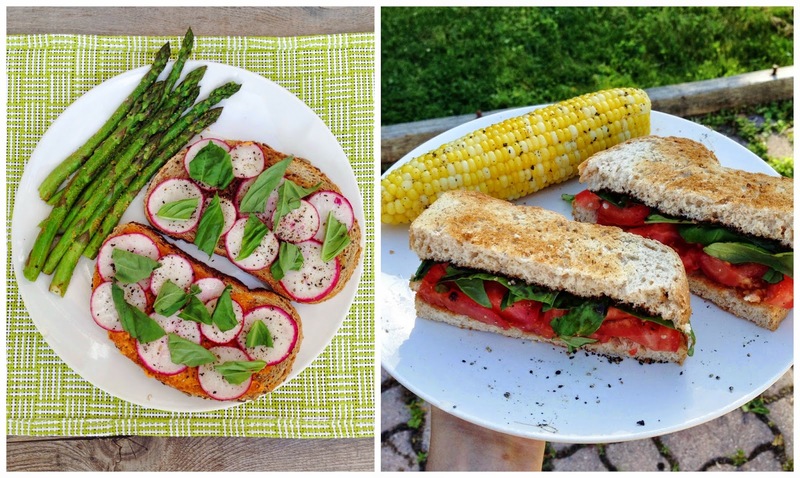 In the meantime, I thought I would do a post about what I've been eating over the summer - even though I didn't spend as much time cooking or developing my own recipes, I still enjoyed lots of good food! A lot of my meals were super simple dinners that I could throw together quickly as I was so busy working on my dissertation. I ate a lot of toast with various toppings like avocado or sliced radishes with butter or hummus, and I loved eating fresh tomato and basil sandwiches. I also added a cob of corn to my meals whenever I found local corn at the grocery store! Near the beginning of the summer, I made a big batch of veggie burgers at my parents' house so that I could pull one out of the freezer any time I was there for dinner and needed a vegetarian option. 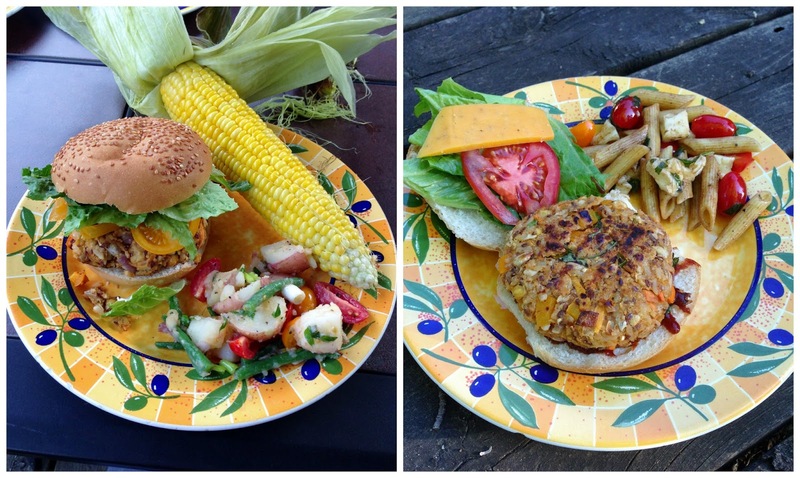 I loved the flavour and texture of these BBQ chickpea burgers from Oh She Glows, and they made the perfect summer meal with a side of potato or pasta salad! I always love eating panzanella in the summertime. I usually stick to traditional combinations of ingredients like tomatoes, cucumber, basil and sometimes cheese, but I really liked this fruity variation with strawberries and cantaloupe that I threw together! 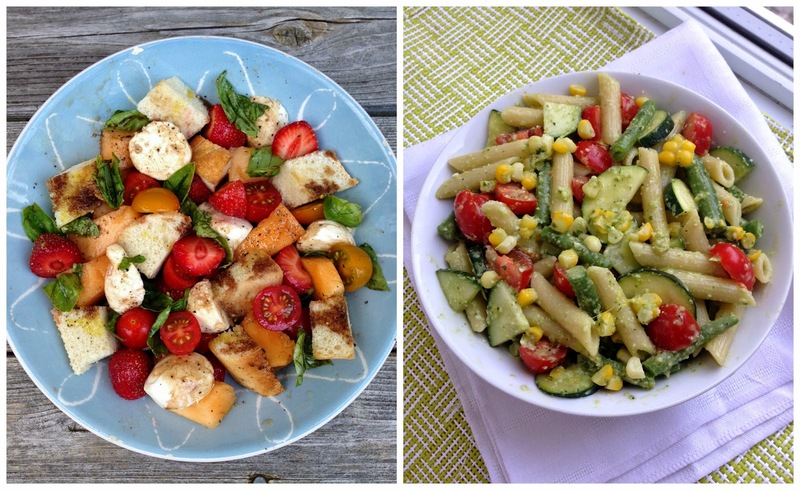 On the right is a pasta salad that I made twice this summer - it's a variation of this recipe from the blog archives, but with some changes to the veggies (like corn instead of peas and extra zucchini and cucumber) and I left out the tofu and walnuts. My favourite part of this salad is the creamy lemony basil dressing! For other quick and easy meals, I made pasta with avocado sauce (pictured on the right), following this recipe from Oh She Glows, and zucchini noodles with a sauce I whipped together using hummus (on the left). 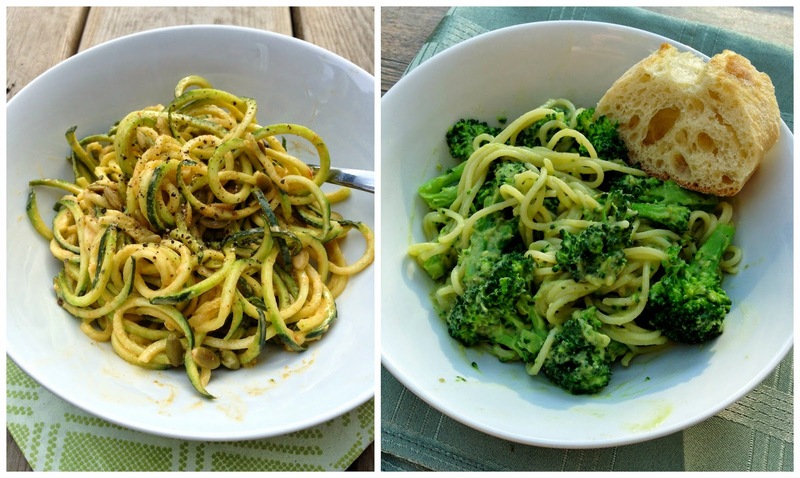 I didn't use my spiralizer as much this summer compared to last year, but I still love "zoodles"! 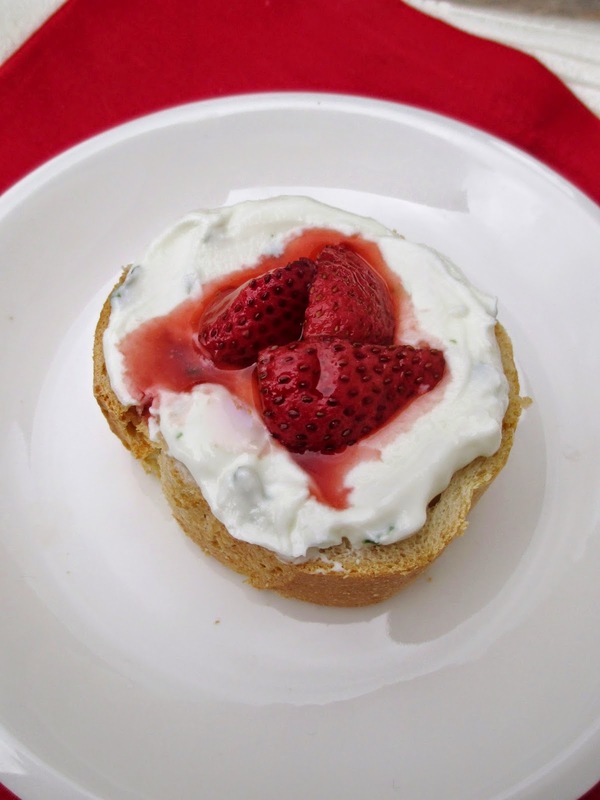 For Canada Day in July, I brought these red and white cream cheese-stuffed strawberries to a party and while they got pretty messy on the trip there, they were still a hit! I can't remember the exact recipe I followed, but this one from The Comfort of Cooking is a good example! I managed to break out my ice cream maker once over the summer to make this chocolate stout ice cream. I followed a recipe from The Beeroness, but with a few minor changes (I reduced the sugar, left out the toasted coconut, and added a bit of arrowroot powder to thicken it). I thought it had just the right balance of chocolate and beer flavours, and I loved how it stayed creamy rather than turning icy in the freezer like other vegan ice creams tend to do. 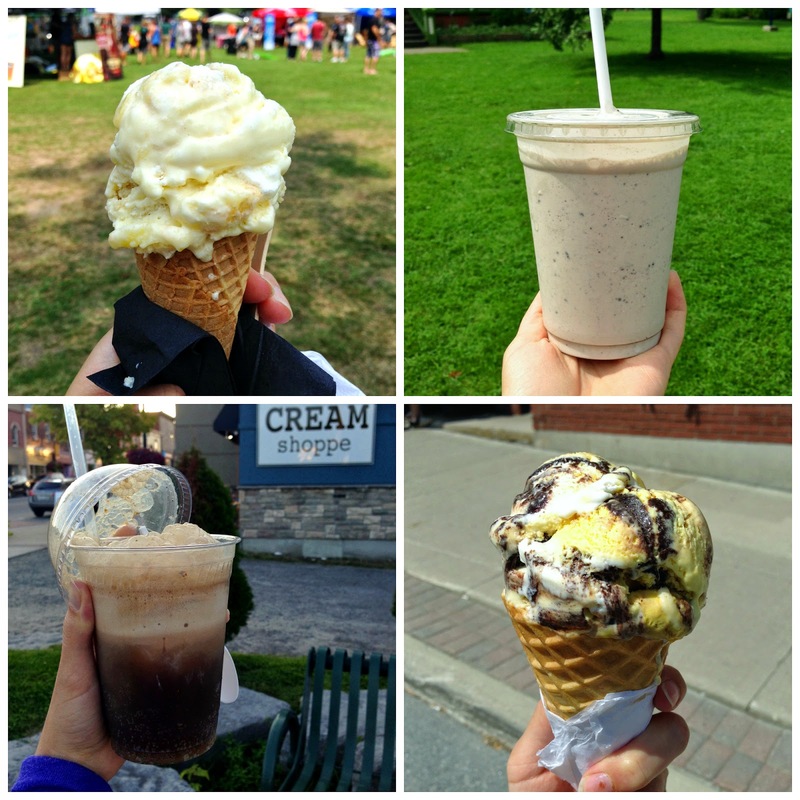 Other than my homemade ice cream, I ate a lot of delicious ice cream treats over the summer, from countless bowls of self-serve frozen yogurt, to an amazing lemon meringue pie cone, to a couple of treats that I haven't had in ages - a cookies and cream milkshake and an ice cream float! I also visited food trucks a few times over the summer, as my city has developed a pretty good food truck culture over the past couple of years. 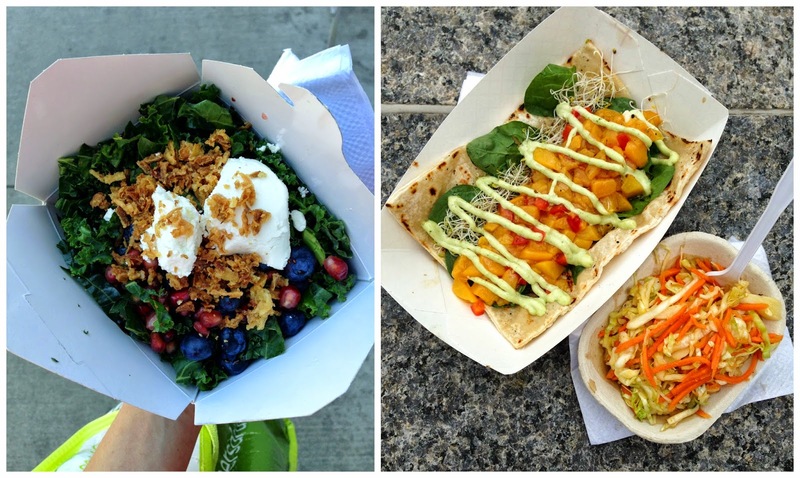 It's usually hard to find vegetarian options, but I loved this kale salad and flatbread with brie and peach chutney! Finally, I also enjoyed many meals out at restaurants over the summer. 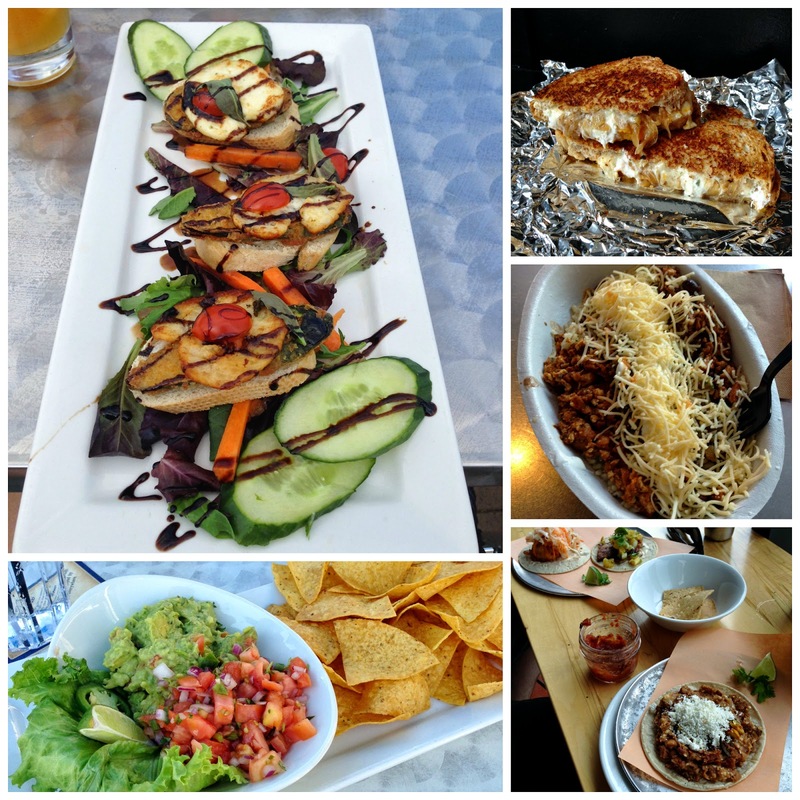 Our patio weather seemed a bit limited this year, but I still tried to enjoy eating out on patios as much as I could! Pictured above clockwise is some halloumi and fried zucchini crostini, caramelized onion grilled cheese, a tofu sofritas burrito bowl from my very first visit to Chipotle, and more Mexican food with tacos, chips, and guacamole.